People get cranky when you mess with Thanksgiving. As a newlywed, I once misguidedly served lobster on the most popular food holiday of the year. We were a small group, and I rationalized that the Pilgrims may have eaten lobster that first Thanksgiving. I had to keep a low profile for a while after that. We Americans do love our Thanksgiving food traditions: the mountains of buttery mashed potatoes; the boatloads of gravy; the pie; the stuffing; and of course, the big bird in all its Rockwell-esque glory. Despite our cultural and ideological differences, 88 percent of us eat turkey on the fourth Thursday of November, according to the National Turkey Federation. Pretty incredible, huh? But truth be told, most of those Thanksgiving birds aren’t so great. The modern turkey’s architecture is to blame: the breast meat usually overcooks and dries out before the dark meat is ready to serve. Not that cooks haven’t tried to solve that problem. Who among us has not soaked cheesecloth in butter and draped it over the turkey breast, or cooked the bird in a paper bag, or started the turkey breast side down, awkwardly—even dangerously—flipping it to finish cooking? A friend actually serves his turkey in two courses—white meat followed by dark. (As if the Thanksgiving meal wasn’t hectic enough.) And then there’s spatchcocking, which in my opinion—and Steven agrees with me—looks like you ran over the bird with a steamroller. Well, this year, I’ve opted for something radically different. Turketta is perfect for smaller gatherings (one feeds 4 to 6 people); make two if you want leftovers as turketta makes amazing sandwiches. Can be assembled a day or two ahead. The seasoning paste acts like a dry brine, resulting in succulent and juicy meat that cooks faster than a whole bird. 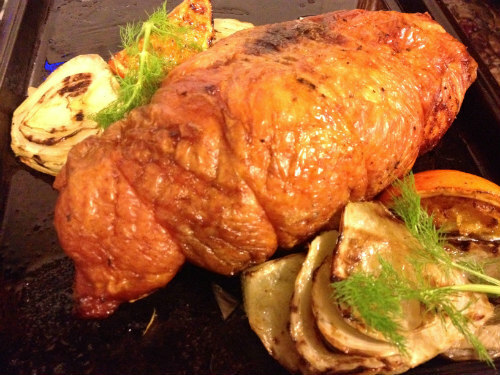 Can be indirect grilled or rotisseried, freeing up oven space in the kitchen. Because it’s boneless, carving is a cinch. Diners get moist meat and crisp skin with every slice. Takes up less space in your refrigerator than a whole bird, especially one submerged in a container of wet brine. The most difficult thing about making turketta is deboning the turkey breast. A sharp, flexible boning knife helps. If you’re unsure of your knife skills, there are several helpful resources online to guide you through the process. (Of course, your butcher could make quick work of the task.) The important thing is to relax and take your time. I was working in a minimally outfitted kitchen when I did my recent turketta practice run, which slowed me down a little. Undistracted, prep for the entire recipe should take 45 minutes or less. That includes making stock for gravy from the turkey breast carcass. Everyone at the table was oohing and aahing over the turketta when it came off the grill. Lacking a proper platter due to a move, we simply served the roast on a black baking sheet with grilled orange quarters and sliced fennel. Next time, I would take Steven’s suggestion and tuck herbs under the skin before tying with butcher’s string. 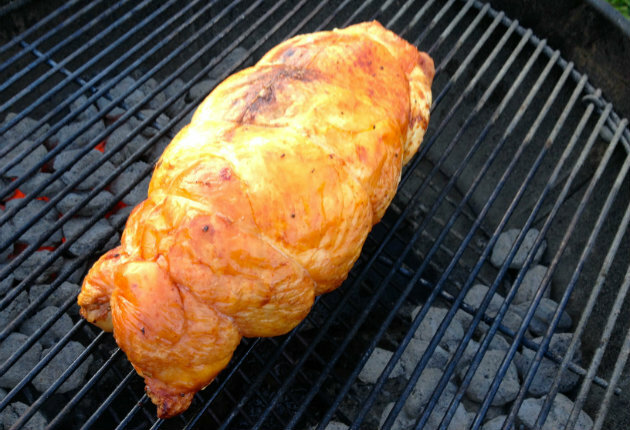 Click here for the “turketta” recipe. And on Friday, we’ll give you a spectacular whole grilled turkey that would have made Norman Rockwell proud.